We can admit it. Ever since we saw the first Jurassic Park movie, we wanted to be a velociraptor. Sure, those raptors spent most of the movie hunting the staff and guests of the park, but they were almost as cute as they were menacing, weren’t they? The way they grunted and screeched while trying to find Lex and Tim in the kitchen? The way they attacked Muldoon in the jungle? Downright adorable… Okay, okay. Maybe the velociraptors in the movies weren’t exactly cute! Maybe they were terrifying dinosaur death-machines and they only got more frightening in the Jurassic World movies. At least Blue isn’t quite the monster that the rest of them are! Blue listens to Owen Grady, which is pretty cool. You could have your own little velociraptor in your home. All you need is this child Jurassic World Blue costume. This officially licensed child velociraptor costume recreates the dinosaur from Jurassic World: Fallen Kingdom. 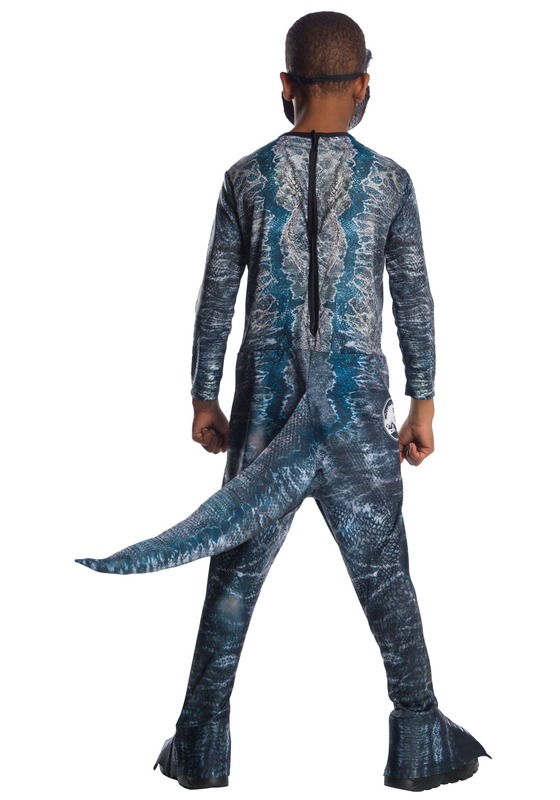 The costume comes with a jumpsuit that has dinosaur scale print on the exterior. It even has a lizard-like tail attached to the back of it. You can stuff the inside of the tail to create a more rigid appearance, or leave it hollow for a more loose appearance. The feet have shoe covers with claw-like designs on them. Of course, it comes with a mask as well, so your child can look just like Owen’s favorite dino pal from the movie. 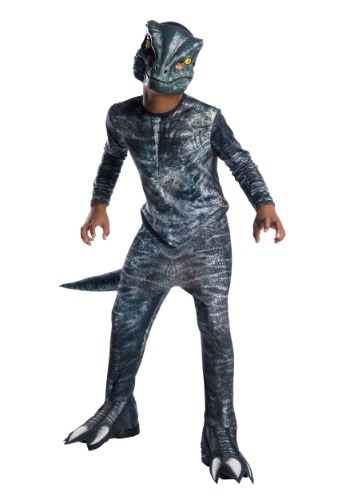 If your child wants to terrorize park visitors or if he just loves dinosaurs more than anything else, then this child Jurassic World costume is for him. If you just want to have a dinosaur hanging around the house, then this costume is exactly what you need. Be sure to check out all of our Jurassic Park themed costumes so you can make a full family group of dinosaurs this year!